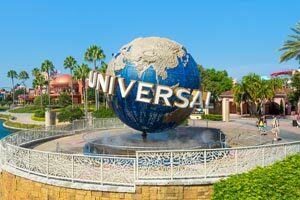 Located in Orlando, Four Points by Sheraton Orlando International Drive is in the entertainment district, within a 5-minute drive of Universal’s Volcano Bay™ and Orlando International Premium Outlets. This family-friendly hotel is 1.3 mi (2 km) from Universal CityWalk™ and 2 mi (3.2 km) from Universal Studios Florida™. Make yourself at home in one of the 301 air-conditioned rooms featuring flat-screen televisions. Your room comes with a pillowtop bed. Complimentary wireless Internet access keeps you connected, and cable programming is available for your entertainment. Private bathrooms with shower/tub combinations feature complimentary toiletries and hair dryers. Don't miss out on recreational opportunities including an outdoor pool and a fitness center. Additional features at this hotel include complimentary wireless Internet access, concierge services, and wedding services. Spending a day of fun is easy with the complimentary theme park shuttle. Enjoy a satisfying meal at Tropical Palms serving guests of Four Points by Sheraton Orlando International Drive. Unwind at the end of the day with a drink at the bar/lounge or the poolside bar. Buffet breakfasts are served on weekdays from 6:00 AM to 10:00 AM and on weekends from 6:00 AM to 11:00 AM for a fee. Featured amenities include a 24-hour business center, limo/town car service, and express check-in. Planning an event in Orlando? This hotel has facilities measuring 6588 square feet (612 square meters), including conference space. Free self parking is available onsite. The preferred airport for Four Points by Sheraton Orlando International Drive is Orlando, FL (MCO-Orlando Intl. ).